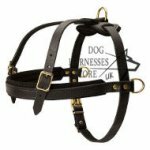 All basic dog bite training classes are done on the dog lead or behind a fence. This means that a helper works very close to the dog and the dog bite is strengthen by the leash pulling. 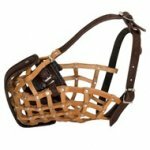 That is why we have to come to dog bite training without the fence and the dog leash as quickly as possible. Usually, dog trainer does this when the dog is left after the helper, in other words the dog follows the helper and bites him. This needless and useless time wasting for the dog takes undue energy. You have to check your dog for courage each time after such dog training. 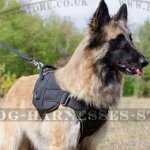 This means that you train your dog to do only that, what is necessary at the moment with this traditional method. 1. The dog should have an opportunity of free moving to the snap ("bite"). 2. 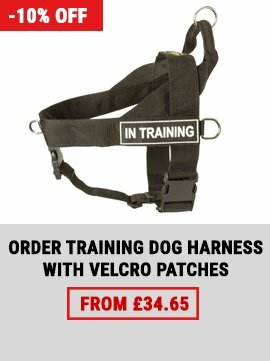 The dog should show correct movement to the object when doing the exercise to do a correct snap during each attack dog training. 3. 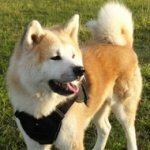 The dog should be ready to snap ("bite") without thoughts and doubts, without delay and by-movements. Gottfried considers that it is possible. I.e. 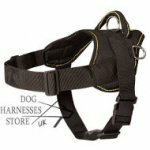 dog training of the frontal bite is possible at a short distance when the dog reaches the object - the snap in 2-3 jumps (without the dog lead). The distance to the helper is defined individually for each dog, but anyway it is given an opportunity to snap the bite sleeve in full force for 1-2 steps and for a powerful jump. The effect of excitation of the dog on a leash and her start-up should be similar to a throw of an attacking snake. 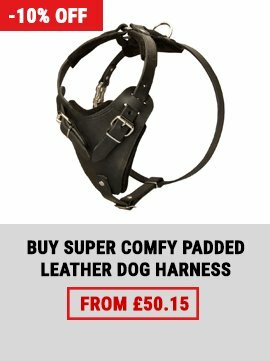 Frontal bite begins with the moment when the dog owner holds the dog on the dog lead and the helper excites the dog slightly close to it (not very aggressively). The helper holds a protective sleeve sideways or even behind the back. 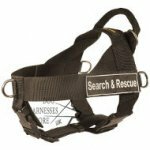 The helper should eager to draw the dog's attention to himself using supportive tools as few as possible. Any nervousness or hysteria of the dog should be excluded. As soon as the helper sees that he reached desirable behavior of the dog (it tries to attack the helper without nervousness), the helper nods - gives a signal to the dog owner to start-up the dog. The helper stands still and holds the threatening stance till the last moment and shoots out the protective sleeve before the attacking dog in the latest moment only. As soon as the dog snaps the protection sleeve, the helper confirms the snap releasing the dog training sleeve. 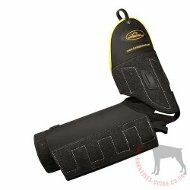 Grip is the following giving back of the bite sleeve to the dog without fight. 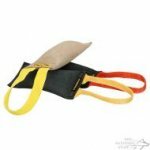 It is common practice when the dog is hold on the protective arm sleeve for some time to train it to fight. Thus the helper works over the dog with an agitation stick and a kind of fights at the same time stimulating the dog in such a way. 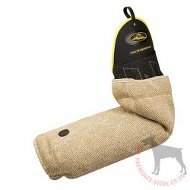 The good helper is able to train the dog to snap, hold, he lifts the dog on the bite sleeve using the agitation stick. In this case the idea is that the good fight of the dog against the helper is supposedly its encouragement. This, supposedly, should lead to better and harder snaps. Gottfried considers that this point of view is absolutely incorrect and is supported with nothing. 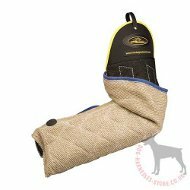 It is obvious that when the dog bites the protection sleeve you should encourage it at the moment. You have to give the bite sleeve to the dog. That is why Gottfried considers that increasing the time of biting the protection sleeve harms the dog and leads it to atrophy of perception of the events, apathy, inactivity. Therefore the process of biting should be shorter in time as possible. The dog that was trained to snap in short periods of time would look better when demonstrates the snap. After the helper gives the bite sleeve to the dog, its owner takes some steps back and promotes the dog to come up (return) to the training sleeve. 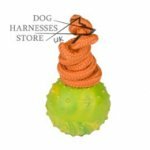 Then the dog owner takes the dog by the dog lead and passes large circles with the dog until it leaves the protective sleeve willingly. 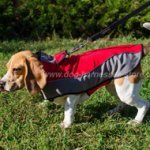 After that the helper comes to the dog slowly and blankly (at an angle a little), doesn't look at the dog's face, takes away the dog training sleeve and continues exercising. 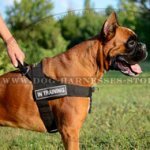 You should also consider the next moment when train the dog to perform the frontal attacks: if the distance between the dog and the helper is too short or too long, the dog can't work optimal. This will reduce the working efficiency and the attack itself. The task of the helper is to choose the ideal distance for each dog. The helper will be able to define how it will be better for the dog to perform these frontal attacks. The helper is obliged to give the bite sleeve to the dog always equally because it can affect the dog's vigor. The dog should foresee the actions of the helper, this means if the helper makes the movement with the bite sleeve in a different way at the last moment, this can influence the movement and vigor of the dog at the moment of snap performing. 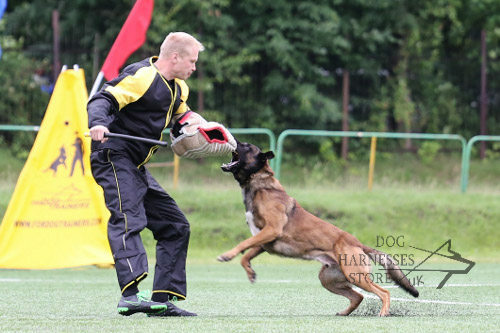 Frontal attacks should be performed 4 times for the dog training and the dog is justified to take the bite sleeve away from the dog training ground after the last attack. 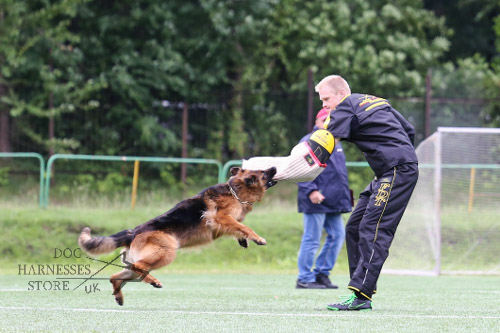 In some weeks of such dog training the dog has to show the skills of powerful bite, good teamwork with the helper, confidence that it holds the protection sleeve in its mouth strongly, moves rapidly with it and throws the training sleeve away willingly. 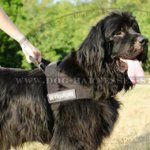 After that it is possible to start training the dog to sit and to bark which are the fundamental exercises of protection dog training. 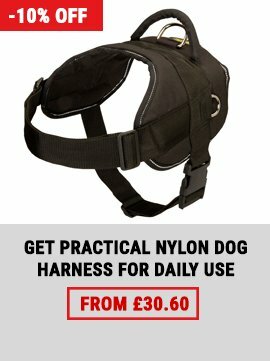 Protective sleeves for dog bite training, click on the pictures! 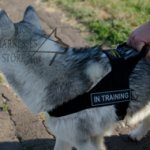 See our collection of bite sleeves for professional dog training! Read also once again about dog training.